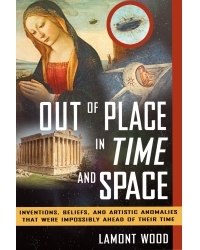 “Eminently readable and written with a wry sense of humor, this hugely enjoyable and informative book truly challenges our accepted perceptions about the nature of time and the order of things. Wood investigates temporal anomalies in an intelligent, thorough, and logical style. I urge you to read this book—you’ll never look at reality in the same way again." There are many examples of technology and beliefs appearing decades—even centuries before they supposedly originated. The Apollo Program was outlined a century before it happened. A painting from the Middle Ages shows a flying toy helicopter. We’ve found ancient Greek computers and heard stories of Roman death rays. The Pacific Front of World War II was described 16 years before the war started. Objects, beliefs, and practices from the present that show up in the past, long before they were supposedly invented. Personal careers that appear to have been founded on knowlege of the future. Roman-era machines that were hundreds of years ahead of their time. UFOs, never officially documented in any time period, yet still showing up in medieval paintings. As a journalist and freelance writer of wide experience, Lamont Wood is familiar with the sometimes arbitrary distinction between cause and effect, and the subsequent gulf between what happens, what is experienced, what gets written, and what is understood. He has been freelancing for nearly three decades. Visit the books facebook page for more info.